Over one-hundred legal documents have been uncovered this month which has revealed many different land transactions surrounding Bachelors Grove cemetery. All of the documents are currently being reviewed but it may take a little while before they are archived and accessible on-line over at www.bachelorsgrove.com for further review by the general public. 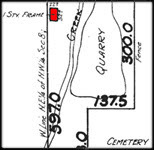 Among those documents are some very interesting maps, deeds, legal proceedings and other various materials which indicate that more than three homes existed near the cemetery. Looking at much older Plat of Survey maps has revealed not only barns and silos, but also a hen house, hog house, deep wells, sheds and more. One house was less than 300 feet from the cemetery near the pond and may possibly relate to a Phantom Farm House sighting that occurred some time in the early 1970s. During a 1987 WLS television broadcast, Ted Visnec of Illinois spoke of his own experience with a "farm-style" house. In the interview he points and walks toward the direction of where he and his associates all saw the house, which would be within the northwest area adjacent to the cemetery. One interesting document is a Plat of Survey map created on March 12, 1928 which was recently discovered this month. Within the map it indicates a one story frame house 22 x 32 feet in diameter, once owned by Christ Boehm, located in the direction of where Visnec was walking and pointing toward during the broadcast. While on-the-air Visnec stated, "The house looked like, like a farm-style house, you know like a, one, you know like one big building, you know like that, it wasn't like a new modern building or anything like that" For further details view the video below. Additional documents are being recovered in regards to the property which may reveal why no physical signs of the house exist such as concrete foundations. Considering how small it was it would not be unusual for it to never have received a stone or concrete foundation. It may not have been on the property for very long anyway. One question may still go unanswered. Is this the same, or more specifically, the 'exact' location where Visnec and his friends saw the house? Attempts are being made to contact Ted Visnec in person, whom has been out of telephone contact with past researchers for quite some time. He may be going through some health issues so a personal visit has to be made to his last known whereabouts. What is known at the moment is that Visnec would have had no idea that a real house existed at that location on the map. Information available so far indicates that not only was the house probably gone by the 1940s, but some of the very earliest researchers such as Richard Crowe were not in possession of these maps. Any chance that the location could have been leaked appears very remote as the map was not considered easy to find. If you or someone you know has information pertaining to the location of Ted Visnec we urge you to contact us as soon as possible so that we may attempt to arrange an interview.